deFacto unleashes the full power of Microsoft Azure Machine Learning predictive analytics for business forecasting applications. Customers can now be operational in as little as one day. Customers can now have predictive forecasting up and running in one day. deFacto Global Inc. is pleased to announce the availability of deFacto Predictive Forecasting, a feature that brings predictive analytics based on Microsoft Azure Machine Learning to businesses of all sizes and across all sectors. deFacto Predictive Forecasting provides seamless integration with Microsoft’s Azure Machine Learning to give business managers predictive analytical capabilities previously accessible to only the largest enterprises. With deFacto’s installation and setup support, businesses can have predictive analytics up and running in one day. deFacto Predictive Forecasting puts predictive analytics at the fingertips of business managers everywhere. The solution allows business managers to perform timely predictive forecasts as needed, based on the business context and parameters of the specific problem their business unit seeks to solve. Prior to deFacto Predictive Forecasting, business managers struggled with the “last mile” problem, the ability to request and automatically process and deliver forecasts to business users in the timeframe and business context they need to manage their business. The new solution eliminates the need for data scientists and expensive data processing capacity and adds the critically needed user interface, the lack of which has limited the use of predictive analytics. deFacto Predictive Forecasting simplifies the entire process and provides a way to build the predictive application in a fraction of the time. And it has the ability to completely automate the forecasting processes that supplement or completely replace manual forecasting. 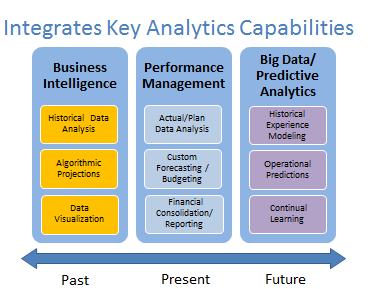 Microsoft Azure Machine Learning provides the resources needed to design, build, and operate predictive analytics models, while deFacto provides the resources needed to design, integrate, and operate the advanced forecasting capabilities within the deFacto Business Planning platform. Adding Azure Machine Learning further extends the capabilities of the already formidable deFacto Platform, which analysts have called “a leap ahead” and “the future of business analytics.” Leveraging their extensive experience developing leading products offered from Oracle, SAP, and Microsoft, deFacto’s team of experts created an advanced business planning product that empowers business users to easily build, deploy, and use intelligent models to manage their business, then share those models via the online deFacto Marketplace. The deFacto solution is based 100% on open Microsoft technology and uses in-memory processing and unique engineering that takes advantage of the full Microsoft business intelligence (BI) stack. Native Excel, web, mobile and BI interfaces give business users access to the full capabilities of deFacto anytime, anywhere, in a way that best meets their needs. The latest version of deFacto Planning provides a cloud-ready SaaS solution on Microsoft Azure that gives business planners an easy and cost-effective adoption path to utilize the most powerful corporate planning solution on the market. 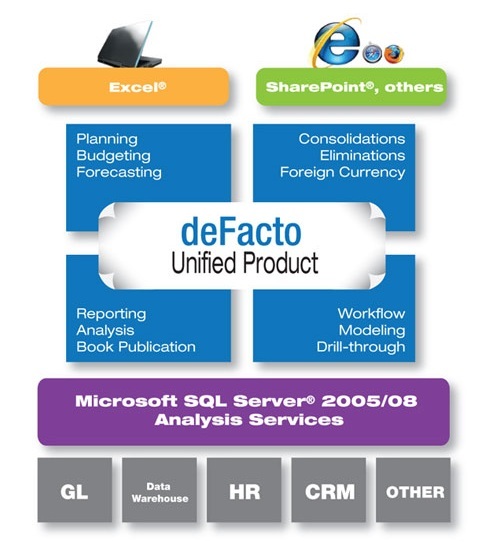 deFacto Global is a U.S.-based Microsoft-centric software company formed by experts who over the past three decades have built and implemented corporate performance management (CPM) and planning products for thousands of customers. Our mission is to enable businesses of all sizes to achieve stellar operational and financial performance. 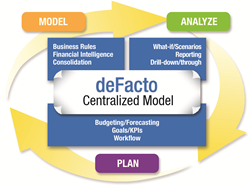 Our product, deFacto Planning, offers enterprise-quality capabilities to automate, streamline, and optimize management, analysis, and reporting of data in the most timely and effective manner for the purpose of making better business decisions. We serve customers throughout the world, ranging from middle-market to large global corporations, helping them with their business performance management. For more information, please visit http://www.deFactoGlobal.com. Follow deFacto on Twitter @deFactoCPM.